Prepare for takeoff with the Chemical Guys Made in LA Jet Tag Keychain! Whether your ride is a high horsepower muscle car, a lithe canyon carver, or a low rider on air, every time you pull your keys out of your pocket, everyone will know just where you get your shine from. Los Angeles: the City of Angels is known for its beautiful beaches, palm trees, movies, and sunny weather, but LA is also home to the Chemical Guys headquarters where detail perfectionists work tirelessly day and night to create the ultimate detailing products to restore and pamper your ride. 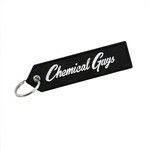 The Chemical Guys Made in LA Keychain not only looks good, it also helps manage that overflowing mess of keys, membership tags, and fobs that clutter your pocket. The reinforced key ring ensures that it can hold even the most elaborate collection of keys and paraphernalia securely, assembling them in one easy to hold accessory. Extracting your keys from your pocket shouldn 't be a battle, so make it easy with the Chemical Guys Made in LA Keychain! Stylish with Chemical Guys written on one side and our iconic logo and MADE IN LA on the other, the jet tag keychain not only looks great but serves a practical purpose as well. Fishing your keys out of your deep pockets is no longer a chore with the Chemical Guys Made in LA keychain. The soft fabric tag is easy to grasp and you can even leave it hanging out of your pocket for easy access and to show the world just where you get your shine from. You don 't have to worry about the tag scratching your car when detailing either, the keychain uses precision machine stitching to prevent scratching when accidentally rubbed against sensitive paint exteriors. The extra thick expertly stitched fabric tag is soft, yet durable to withstand even the heaviest collection of keys and constant daily abuse. The black color of the tag ensures that even on those filthy detailing jobs, it will still look great and won 't soil nor show dirt. Now, if anyone asks you where you got your shine from, you can say: it was Made in LA.